Last weekend I took off on the friday night flight from Rome to Budapest! I arrived very late and had just the time to catch a glimpse of beautiful Budapest by night before I hurried off to sleep. 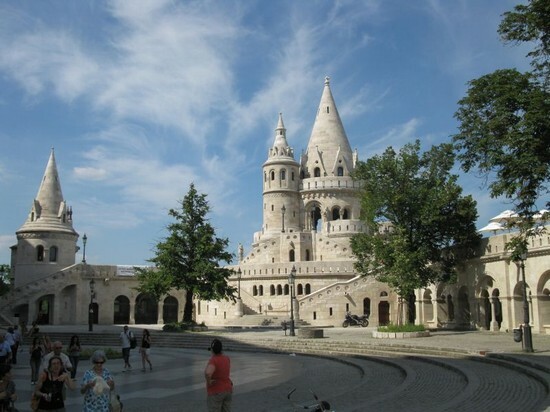 The city of Budapest was founded in 1873 when the cities of Buda and Pest, located on opposite sides of the Danube river, were united giving the city it’s current name! The Buda side is covered by green hills, and it is surmounted by the Buda Castel district. For lunch I headed to Pest where I relaxed dipping my feet in the pool in Erzebet Square while I sipped on Soprano – the local beer, made in the classic version or in a huge variety a fruit flavors- and ate a plate of hungarian sausages with baked potatos I picked up at a nearby food stall. 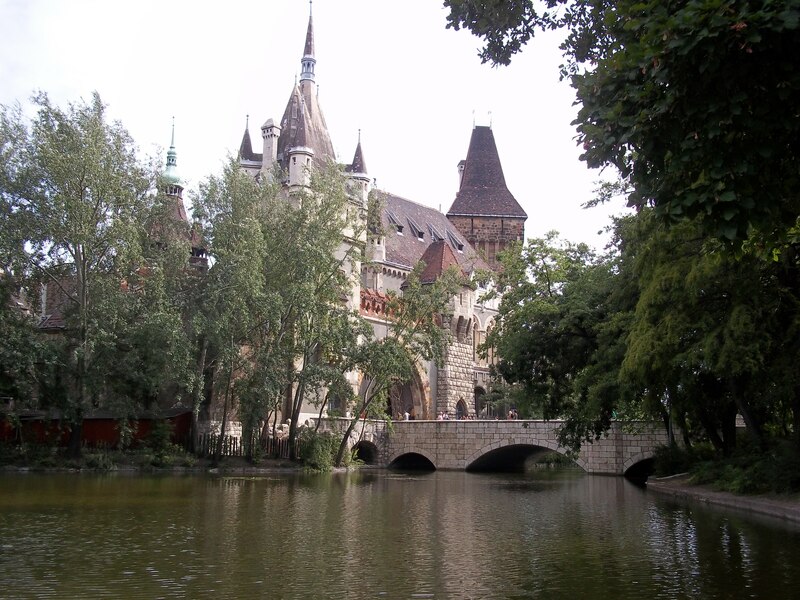 After that, I headed off for a “digestive” stroll in Városliget Park where the locals rent boats and idly row around in a pretty pond that surrounds a caste-like palace. Fishing was also a great pastime around the pond, and a group of hungarian kids had a blast feeding the fish that their father caught to some pretty overweight ducks. After exploring some more of Pest’s churches, monuments and squares, the next stop was Budapest’s historical Café Gerbaud. Here I had a delicious eight layer chocolate and fudge cake with coffee while feeling like quite the lady in the midst of the café’s early 20th century furniture and interior design. 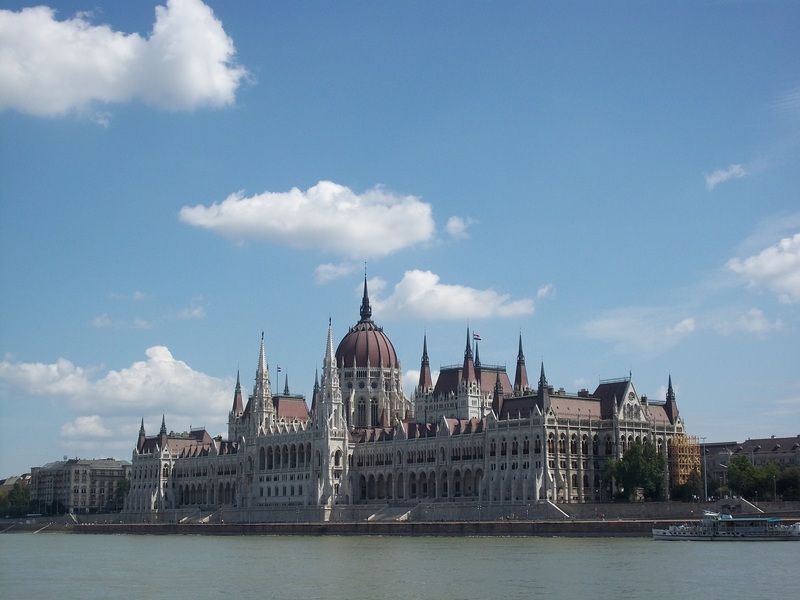 I then went on exploring Pest, stopping at it’s famous neo-gothic Parliament building, one of the city’s most famous and impressive sites. In the evening I headed off to Kaltenberg Restaurant and Brewery where I dined with home-brewed organic beer and Goulash, the typical hungarian beef stew that melts in your mouth! It was served with some funny looking but very tasty dumplings called Galuska, which are home-made with flour, water and egg. To finish off the dinner I tried a pear-flavored Palinka, the traditional hungarian fruit brandy… delicious, but VERY strong! The next day, after some sound palinka-induced sleep, I took the boat ride along the Danube and admired the breathtaking sight of Buda and Pest from the River. The boat dropped me off at Margaret Island, the island that sits in the Danube between Buda and Pest. This island hosts an immense and lovely park where hungarian sun-bathers lay around not at all dissuaded by the chilly breeze. After enjoying the park, I hopped back on the boat and got off at Pest where I wandered though the market hall and the famous pedestrian street. Here you can find some very funky war souvenirs, like aviator hats, medals and old radios. I left truly bewitched by this beautiful city and it’s warm and friendly people! Are you wondering how I managed to do all this and much more in just two days?? All of this is available for you at a very reasonable price … ask our reservation agents and find out more! Trust me… if you want to get a taste of Budapest, you can’t miss the Welcome Pack!